Lu Liangliang files his final report from the Antarctic before returning to Finland. Part 3 of 3. SA Agulhas II. Archive photo. On 15 January, the ship lost contact with the autonomous underwater vessel AUV 9, which was conducting a sea trial under an ice floe. A search was started to look for AUV 9. The ship began to carve the multi-year ice, 6–10 meters in thickness. According to data recovered from AUV 9, the ice measured 20 metres at its thickest. The ROV attempts to catch a sinking AUV 9. AUV 9's signal was found again after a long time spent breaking into the ice. The remotely operated underwater vessel (ROV) was sent down to look for and recover AUV 9. It did not take long to locate it, but the rescue posed a problem as AUV 9 began to sink to the sea floor. On the morning of 19 January, after several attempts with different approaches, the autonomous vessel was finally back on board. During the search, ice field work was conducted on the floe and a 5.5-metre ice core was extracted, while snow thickness and the freeboard of the ice were measured by snow radar, etc. 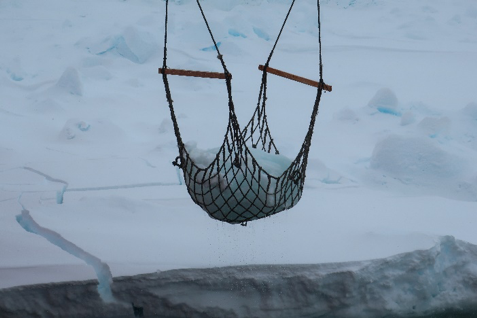 When the ship left the floe, we fished another ice sample out of the water. The sample was cut into an ice beam, which then underwent a bending test to measure the flexure strength of the ice. The science programme continued after the recovery of AUV 9 and carried on until 27 January. CTD measurements and sediment corings were conducted in various locations in the Larsen C area. Meanwhile, the ROV also made biology dives into the sea and sea floor to investigate the rich and still relatively unknown marine life. AUV 9 also was put back into action to scan the other selected sea ice floe underwater on the 24th and 26th with the ice field work going on the ice floe. AUV 7, used for scanning the sea floor, also underwent a sea trial during this period. On 27 January, Agulhas II headed for the sinking site of Ernest Shackleton's ship Endurance to begin looking for its wreck. However, the ship had to sail for King George Island on 30 January to resupply, as the ROV's pressure housing was damaged during a dive. We arrived at King George Island on 1 February, and part of the science team left the ship. While waiting for the supplies to be delivered, we had a chance to go ashore. There are many Antarctic stations of various countries in the area – we visited the Chilean and Russian stations. I walked a bit farther to visit the Chinese Great Wall station as well. The ship's crane is put into use to break free from the ice. The fog in and around King George Island made delivering the supplies extremely difficult, and as time was an issue, we had to leave without them. On the evening of 5 February, we departed King George Island and set a course for the Endurance's sinking site. The ship sailed at full speed and met ice on 8 February. The next day was a foggy one, and the ship got stuck in ice for almost 18 hours before breaking free. Seals visit the ship's moon pool while we stop to look for a signal. On 10 February at around 05:30 (UTC), we passed sinking site of the Endurance (68°39’S 52°26’W). AUV 7 was launched into the water to begin searching the sea floor for the wreck. The plan was to use the ship to break the ice and intersect with the route of AUV 7 so that the ship can make sure it was safe on the track. After several “handshakes”, however, no further signal was received from AUV 7 – it had gone missing. 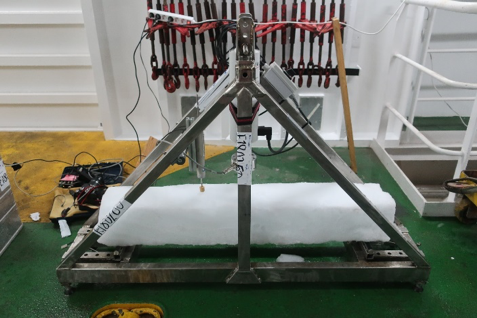 Agulhas II began to break the ice to look for AUV 7 in what were considered the most likely positions, but we found no signal. On 13 February, the search was called off and the ship left the search area as ice conditions deteriorated. Signatures of Weddell Sea Expedition 2019 team. We got clear of the heavy ice on 14 February and stopped aside an ice floe and to collect more ice samples, take group photos and do various other activities. After weathering a storm during 17–18 February, the ship arrived back at Penguin Bukta on 20 February. After people and cargo from South Africa Antarctic base are on board, the ship will sail for South Georgia Island to resupply and then head for Cape Town, which will mark the end of our journey. The estimated time of arrival is 15 March. Weddell Sea Expedition 2019 has been an unforgettable experience with an excellent expedition team and on top of it all we have collected a lot of valuable data. As the journey nears its end, I want to thank from the bottom of my heart the people at Aalto University who supported me with this expedition. Thank you to Prof. Pentti Kujala, Otto Puolakka, Teemu Päivärinta, Prof. Arto Visala, Andrei Sandru, Jakke Kulovesi, Riitta Särkisilta-Lundberg and other colleagues in Marine and Arctic Technology. I am very much looking forward to coming back to Finland. Read more about Lu Liangliang's participation in the Antarctic expedition and learn more about related research at Aalto University. Ship performance and safety takes a young researcher to one of the most remote places on Earth. Part 1 of 3. Lu Liangliang checks in from aboard the SA Agulhas II after departing Cape Town for Antarctica. Part 2 of 3. Lu Liangliang reports from the Antarctic at the beginning of the new year. We focus on the behaviour of ships and structures in normal and extreme environments. We do our research by considering the safety of maritime transportation, as well as the experiences the marine environment can offer to cruise vessel passengers.